"Stella! No, use two hands! Gentle! Ah, crap. Just hand them to me." Cody, Stella and I were all over at Cooper’s house the other day while his parents enjoyed a date night, an event that Cooper (Stella’s best bud and play-date companion) refers to as an “update,” which really makes sense if you think about two parents going out and spending time together away from their one-year-old. Music is almost always playing while Stella and Co0per are together, because they love to dance (which looks a look like jogging–actually, sprinting–in place) during play dates and within five minutes of arrival one or the other starts in with, “Music? Musiiiiiiiic?” So, we’re intermittently bopping to the music and sending miniature skateboards down ramps when this irresistibly sweet, poppier-than-pop song by Meaghan Smith comes on. The chorus innocently asks, “What’s the use in fixing what’ll only break again?” And good lord did it hit the proverbial nail on the head. Pesky tears invaded my eyes and a boulder lodged in my throat and I just danced toward the corner until it passed. As you now know, Stella got her glasses on Friday. We were in the optical shop for an adjustment today, Monday. Already. At first, on Friday morning, I thought she was taking to them amazingly well. She wore them for a long stretch on the playground, briefly removed them and asked me to put them back on while in the car, and she wore them all through lunch. But now I’m realizing that her initial interest can be chalked up to sheer novelty. The more she realizes they’re sticking around, the less wants to do with them. Usually, she’ll wear them for two to five minutes before ripping them off with one hand, stretching the frames in a way that looks like nails on a chalkboard sound. It’s excruciating to see her twist and throw them. But it’s not just that. It’s tough because it’s such a battle, actually more of a war with many, many battles taking place and well-thought out strategies and tactics required for victory. It’s stressful and exhausting to see her tear them off, and then my brain starts whizzing, as in, “Okay, how long can I give her before I put them back on? How long before her eyes are in danger of crossing? What will I distract her with this time–a book? No, we’ve gone though all her favorites already. Stickers! I’ll try the stickers. What if she doesn’t let me put them on–for the fourth time in a row during these last few minutes? Should I put them in the case for a while or is that like giving up? Wait–have I eaten yet today? When does Stella need to eat? Maybe she’ll wear them if I give her some chocolate chip.” Cue the screaming. Like a well-programmed mombot with super human strength and endurance (but not really), I automatically bend over backwards to repair a fragile something that is forever poised to break. The glasses. But also something in me (and maybe Stella, too?). When Stella got over her feeding aversion, no longer required a feeding tube and learned to enjoy eating, I thought we were clear. We were going to be okay from then on. But it wasn’t true. That’s impossible, and every parent on earth faces the same perilous reality. There’s always another challenge, frustration, or heartbreak around the corner. Thank god they’re so damn cute and resilient. And for every soul-searing ER visit and agonizingly difficult hurdle that you somehow muster the strength to clear, there’s–oh, where to begin–thousands of laughs that lift you up so, so high, dozens and dozens of triumphs that affirm you, your child, and life itself, and about seven hundred smiley, silly dances. Not a bad bargain at all, even if the song makes me cry. She’s worth it a million times over. 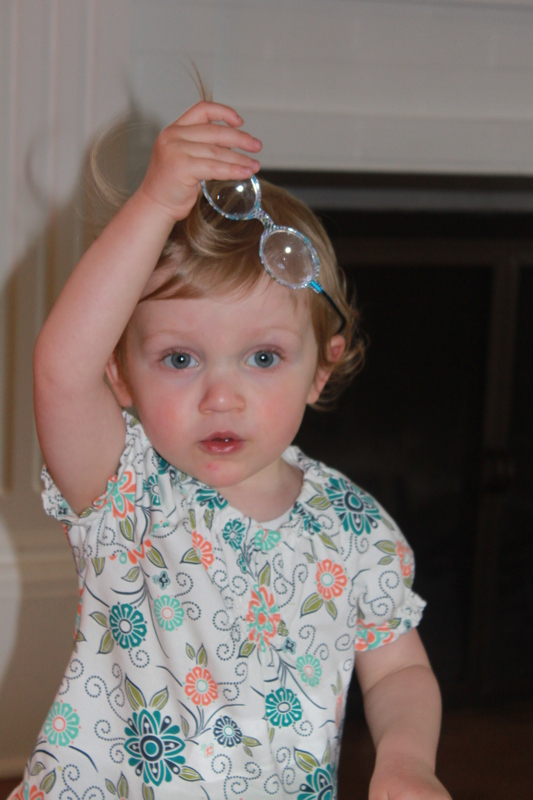 This entry was posted in Frustration Station, Lessons in parenting, motherhood, Stella's eyes, toddler and tagged accommodative esotropia, glasses, heartbroken, meaghan smith, one year old, toddler. Bookmark the permalink. 2 Responses to Put me back together. She should be sent away for being so cute. I love her round blue eyes and adding those glasses is just an overkill. The glasses just makes me envy how good she looks. That’s so sweet! I love them too, thank you for the kind words!